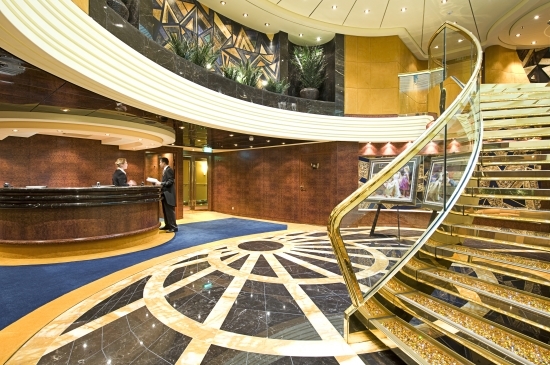 The MSC Fantasia allows you the opportunity to be able to walk on a Swarovski crystal staircase (the first MSC ship to incorporate this) and this is just the start of the luxury that awaits you onboard this magnificent ship. Just wait until you stare at the stars through the transparent ceiling! The MSC Fantasia is the sister ship to the MSC Splendida and before the MSC Meraviglia was the largest ship ever constructed for a European shipowner. She entered service on 18 December 2008 and was christened by silverscreen legend, Sophia Loren. Packed with technology, yet kind to the environment, this modern cruise ship is the proud flagship of the Mediterranean Shipping Company. 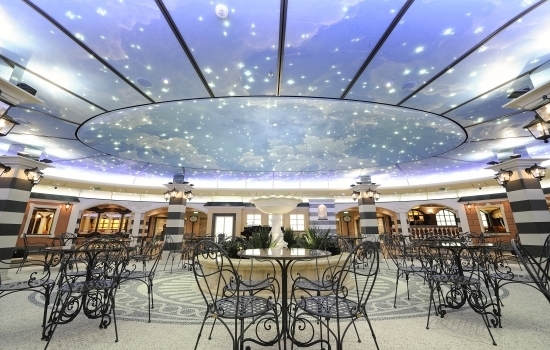 It is a great idea to combine a cruise with a leisurely Italian holiday. You can check availability by filling in the form below (email cruises@southafrica.to if you're experiencing difficulties). In November 2018 the Fantasia was cruising off the coast of south America (replacing the MSC Melody). 7 Dec 2017. The Fantasia makes her first stop in Trinidad & Tobago, stopping at the Port of Spain. Oct 2017. The Fantasia makes her last call at Kiel harbour for the season - she was the largest ship to stop at Kiel during the season. 29 Apr 2017. The Fantasia makes her maiden call at the harbour in Kiel Germany; which will be the first of 21 regular calls at the port - she will be the largrest cruise ship to have used Kiel as a regular stop. 20 Feb 2017: The Fantasia is retrofitted with the SOx exhaust gas cleaning system, becoming the 2nd ship in the MSC Cruises fleet to have it installed, after the MSC Preziosa. The system is made by Yara Marine Technologies. 7 Nov 2011: Dr Pierre Dukan to host a specialised weightloss and fitness cruise. 20 Apr 2011: The Fantasia visits the Port of Valletta and receives a full salute from Fondazzjoni Wirt Artna. 11 Mar 2009: Laura Clements, from Essex (UK) wins a 7 night cruise onboard the MSC Fantasia. 5 Mar 2009: High winds snap the forward mooring lines on 5 March and a passenger gangway collapses. One passenger is taken to hopsital, 3 others treated for hypothermia. 18 Dec 2008: The MSC Fantasia is officially christened by Sophia Loren and enters service, becoming the flagship of the MSC Fleet. 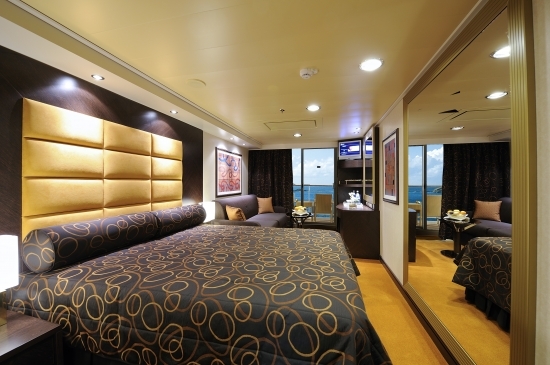 April 2012 Georgieali rates their first cruise ever on the MSC Fantasia and gives it a firm 4 out of 5. January 2012 As disaster strikes on the Costa Concordia, Si Liebermann reflects gratefully on their stay in the luxurious MSC Yacht Club. January 2009 Jane Archer sails on the MSC Fantasia for the Daily Telegraph and although she finds the service to be lacking, there are many other redeeming features. The MSC Fantasia is a "Fantasia class" ship, and can accommodate 3,274 guests in 1,637 cabins, 43 of which are for guests with disabilities. The public areas cover 27,000 m2 so you can probably imagine that there is much to do onboard. Waterbabies will be in heaven, with 5 pools and 12 spa baths at your disposal, including a fantastically fast waterslide. 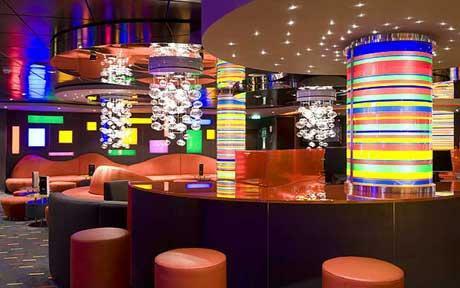 Spend some time exploring all the cocktail bars, the 4D cinema, the karaoke bar and all the shops! The kids will simply adore the North Pole themed play room, complete with slides and books. 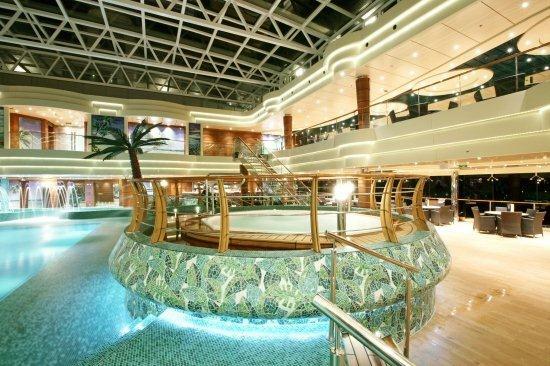 If you think you've been on a cruise ship before, think again. This is what luxury and variety is all about. The Aurea Spa is also particularly popular, with a wide variety of treatments ranging from massages to thalassotherapy. This ship also features several speciality restaurants such as a Tex Mex, French and Italian restaurants. This is over and above all the other restaurants onboard, such as the ultra lux Red Velvet restaurant. The Fantasia is also very well known for it's outstanding MSC Yacht Club, their "ship within a ship" concept, where you have full use of a butler and access to areas restricted from the masses. All the cabins have interactive TV's, mini bars, a safe, an internet connection, phone and air conditioning. Inside cabins will have single beds which can be converted into double beds on request (except in cabins for the disabled), a bathroom with a shower and a very spacious wardrobe. Their sizes range from 13 - 16 square metres. Ocean view cabins are the same as inside cabins, but have a view of the sea. Their sizes range from 12 - 20 square metres. Balcony cabins are basically the same as the others, expect that some of them have bathtubs instead of showers. Their sizes range from 17 - 30 square metres and these cabins have their own private balconies. Balcony suites are similar to balcony cabins, but all of these suites have bathtubs. Their size is about 32 square metres and also have their own private balconies. The MSC Fantasia received this prestigious award from Bureau Veritas for excelling in the following areas: being sensitive to the environment, excellent health and safety regulations, excellent food safety with an extra nod towards their green credentials.